Let's take it outdoors, shall we? Pull on your long underwear. Shrug on your heaviest winter coat. We're headed outdoors for the Game of the Week. And we're not just there for one game, we're tackling an entire doubleheader up in the frozen tundra of Moorhead. 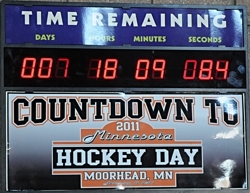 Hockey Day Minnesota 2011 comes to the northwestern Minnesota community with a pair of top games. Wayzata and Roseau kick off the festivities at 10 a.m. Saturday, Feb. 12, on the revamped outdoor rink behind the Moorhead Youth Arena, while the host Spuds entertain Hill-Murray at 1:30 p.m. The most intriguing aspect of the games will be how the teams handle the weather conditions, which of this writing are expected to be nearly ideal. The latest forecasts call for temperatures around 15 degrees Fahrenheit with no precipitation, which should make for hard, fast ice. No telling on the wind conditions, however, as they can vary from minute to minute on the plains. (Update: the latest weather forecast now calls for a low of 30 and a high of 34 Saturday, with morning snow showers). If any team Saturday should be used to old-time hockey, it's Roseau. The Rams (9-10-1) have been up and down this season, with a seven-game winning streak sandwiched between five- and four-game losing skids. Coach Andy Lundbohm can only hope playing out in the elements spurs his team. Roseau has battled injuries and inconsistency, but appears to be getting healthy at the right time. Shane Omdahl (17-16-33) has been the common thread -- and threat -- throughout the season, but he now has fellow snipers Josh Erickson (8-17-25) and Travis Connell (10-14-24) back from injury. Justin Anderson (5-20-25) is a playmaker at the point, while juniors Jared Strand (8-3-0, 2.55, .865) and more recently, Mike Tangen (1-2-1, 3.75, .824) have solidified the goaltending position. Contrary to Roseau's five-game skid to start the year, Wayzata (15-4-2) ripped off 10 straight victories and was ranked No. 1 in the state before finally falling. Since then, the formidable Trojans are just 5-4-2, however, and their vaunted offense has sputtered at times. Still, it wouldn't be prudent to overlook the line of Tony Cameranesi (15-31-46), Mario Lucia (20-20-40) and Tyler Klein (14-17-31), who have combined for 49 goals. Wayzata is also a strong defensive team, thanks to blueliners such as D.J. Jones (4-22-26), Marc Richards (7-17-24), Matt Halverson and Miles Death. They're a very formidable wall in front of starter Andrew McIntyre (10-3-2, 2.57, .866). The host Spuds are practicing on the rink both Thursday and Friday and hope to have a true home ice advantage working against Hill-Murray, the top-ranked team in the Hub's Class 2A rankings. Moorhead (14-6-1) is hoping the circus surrounding the event works in its favor, as the Spuds have lost two straight games to Benilde-St. Margaret's (6-1) and Grand Rapids (4-3) in their own building. Moorhead will likely play the game close to the vest, as the Spuds allow just 2.19 goals per game and score at a clip of 3.33 goals per game. The Spuds' strengths are an experienced defensive corps in front of junior goaltender Michael Bitzer (14-6-1, 2.13, .930), one of the top netminders in the state. The top line of Logan Ness (11-7-18), Bryant Christian (10-17-27) and Brendan Johnson (6-6-12) has been doing much of the scoring recently, although big junior Eric Brenk (10-8-18) has a scorers' touch. Hill-Murray (16-3-1) will certainly test that defense, as the Pioneers are averaging 6.25 goals per game and have won nine straight. In the past two games, the Pioneers outscored Classic Suburban foes Richfield and Simley by a combined 24-0. Senior Ben Bahe (23-19-42) leads a balanced offense that has 13 players with at least 10 points and seven with at least nine goals. But don't count out the Pioneers' defense. They're allowing just 1.60 goals per game and feature rugged J.D. Cotroneo and crew in front of three-year starter Tim Shaughnessy (13-3-1, 1.60, .914). Through the first half of the Lake Conference schedule, these two powerhouses staked their claim for the title -- and it may come down to Saturday night's big showdown at the Pagel Activity Center. At first glance, the advantage is Minnetonka's, as the Skippers have been virtually unbeatable at Pagel over the past four years. Eden Prairie has the head-to-head edge this winter, though, beating Minnetonka 4-2 back on Jan. 27 behind two goals from David Rath. Eden Prairie's Kyle Rau and Minnetonka's Erik Baskin have been two of the hottest scorers in the state. Rau is coming off a four-goal outburst against Buffalo, while Baskin has scored in six straight, netting nine goals. Throw out the records. Throw out past history. While you're at it, might as well throw away the whistles. This one is going to be a war. Duluth East and Cloquet play one of the most heated rivalries in the state. As if there is more fuel needed, Cloquet's leading goal scorer Nolan Meyer (27-15-42) transferred from Duluth East this past offseason. Also watch the Lumberjacks' Karson Kuhlman (15-28-43), one of the state's most exciting freshmen. The Greyhounds won the first meeting back on Dec 16, 4-0, with Jo Jo Jeanetta completing a 22-save shutout. Coaches, players and fans in Section 8AA can easily point to this game as the one that will decide the top seed in the upcoming section playoffs. The two teams tied 1-1 way back on Dec. 9 in Moorhead in the second game of the season. Since then, both have taken care of business in 8AA play, setting up a terrific rematch in Bemidji. Annual contender Moorhead is reeling a bit entering the game, as the Spuds have lost two straight in resounding fashion (including an overtime loss to Grand Rapids). Bemidji is on the upswing, as the Lumberjacks have won three straight since falling to Grand Rapids in late January, outscoring its three opponents by an 18-3 margin. The South Suburban Conference title may already be all but wrapped up, with Burnsville currently seven points up on Eagan and eight up on Apple Valley and Bloomington Jefferson -- but that doesn't mean there won't be bragging rights at stake Saturday night. The Blaze are 13-0-1 in their 14 conference games, including a 5-4 victory at Apple Valley on Jan. 13. Burnsville jumped to a 4-0 lead early in the third period, but nearly allowed the Eagles to claw back into the game. Apple Valley junior defenseman Derek Smith (6-21-27) had a coming out party, scoring a hat trick in the third period to nearly draw the Eagles even. The renewal of Lakeville's civil war comes on Saturday when these cross-town and Section 1AA rivals go at it again. In their first meeting back on Jan. 13, South claimed a 7-2 victory behind its extremely potent top line. Justin Kloos, Alex Harvey and John Wiitala combined to score all seven goals (a hat trick and three assists for Kloos, two goals and three assists for Harvey and two goals and a helper for Wiitala). Defenseman Drew Brevig (five assists) was the only other Cougar in the scoring column. Expect North and top goaltender Charlie Lindgren (7-6-1, 3.17, .909) to be scheming to stop that line in the rematch this Saturday. Experts, and we may use that term loosely, have been reluctant to jump on the Rochester Lourdes bandwagon this season, despite a 19-2-0 start in which the Eagles have allowed just 1.81 goals per game. Most cite a "weak schedule" as the reason not to give the Eagles credit in the state rankings. Last week, Lourdes gained a bit of attention by beating two-time Class 1A champion Breck (5-3) and this week the Eagles have an even better carrot -- top-ranked St. Thomas Academy. A win in Mendota Heights would quiet the naysayers and give Lourdes a huge boost. It's tough to look at the Lake Conference schedule and NOT find a top game of the week. These two clubs get their second look at each other during a very difficult week that also includes games against Minnetonka (for Eden Prairie) and Roseau (for Wayzata during Hockey Day Minnesota in Moorhead). Both are currenlty chasing Minnryonks for the lead in the Lake, which is made even tighter by their 3-3 tie on Jan. 22 in Wayzata. In that game, Eden Prairie's Kyle Rau scored with 3:09 remaning to draw the Eagles into a tie. Wayzata had trailed 2-1 after two, but goals from Kenzie Vold and Mario Lucia gave the Trojans' a short-lived 3-2 lead. Are the Hornets beginning to break out of their annual January slump? It would have appeared to be so after three straight victories over Hopkins, Totino-Grace and Eden Prairie in which Edina allowed just one total goal. But Wayzata then stymied the Hornets 2-1 last Saturday, sending Edina tumbling into fourth place in the five-team Lake Conference. Now comes another chance at redemption against Lake-leading Minnetonka. Despite outshooting the Skippers 22-19 in their first meeting on Jan. 22, the Hornets suffered a 4-1 loss. Erik Baskin had two goals and Alex Glockner made 21 saves for Minnetonka. Both teams are under .500 and have nearly identical records (Mayo at 9-11-1, Century at 9-11-0), but that doesn't make the cross-town battle any less heated. Each still has a chance at the Big 9 title, although the loser of this game will likely be out of the running. It's also the rubber match of an unusual three-game regular season schedule. Century won 4-2 on Dec. 29 at the Kiwanis Holiday Classic, while Mayo took a 3-0 victory on Jan. 20. What to expect in game No. 3? Tough to say after Century outshot Mayo 32-17 on Dec. 29, but Mayo outshot Century 37-22 less than a month later.